For further information please click anywhere on this image. Computer Equipment Validation or Qualification, as it is often erroneously termed, documentation must be compliant with all of the current Good Manufacturing Practice legislation and follow all the associated guideline documents. Since most documents, post the URS, will either fully, or partially, base their contents on the URS, it is essential that this document clearly, concisely and in a manner that is testable, specifies the exact requirements of the end-user. It is also essential that these detailed user requirements remain attributable throughout the development of the Functional Specification (FS) Design Specification (DS) to the actual lines or groups of lines of code that enable them. Traceabilty of URS functionality, to lines of code is an essential element in computer equipment validation (CSV). Once this traceability is establish future maintenance and modification of software is made much simpler and more manageable. Traceability in Computer Equipment Validation. There must be correlation between the elements of the various phase deliverables / computer equipment validation documentation; for example, the correlation between the functional requirements and the test cases that challenge them. This correlation can be demonstrated by using a traceability matrix. This matrix facilitates maintenance of the cross-referencing between requirements, the corresponding design elements, and the test cases that challenge them, as well as between the design and the code. During the design phase, the traceability matrix can help facilitate design review since correlation of requirements to design can unearth mismatches and omissions. Additionally, completing the traceability matrix can help ensure adequate test coverage in the testing phase. In the equipment’s maintenance phase, if any of the requirements or design elements need to be updated due to a change, it is easy to determine what other documents are affected and/or what tests must be re-executed once the change takes place. In short, the usefulness of the traceability matrix cannot be overstated. This type of testing verifies the execution flow of software, including decision paths, inputs, and outputs. Dynamic testing involves creating test cases, test vectors and oracles, and executing the software against these tests. The results are then compared with expected or known correct behavior of the software. Because the number of execution paths and conditions increases exponentially with the number of lines of code, testing for all possible execution traces and conditions for the software is impossible. Code inspections and testing can reduce coding errors; however, experience has shown that the process needs to be complemented with other methods . One such method is static analysis. This somewhat new method largely automates the software verification process. The technique attempts to identify errors in the code, but does not necessarily prove their absence. Static analysis is used to identify potential and actual defects in source code. There is no regulatory requirement to re-validate a process as long as that process operates in a state of GMP control and no changes have been made to the process or output product, the process does not have to be revalidated. Whether the process is operating in a state of control is determined by analysing day-to-day process control data and any finished device testing data for conformance with specifications and for variability. When equipment is moved to a new location, installation and operation should be re-qualified. By comparing data from the original installation and operation qualification (IQ and OQ) and the re-qualification, the manufacturer can determine whether there have been any changes in equipment performance as a result of the move. Changes in equipment performance should be evaluated to determine whether it is necessary to re validate the process. Part 820.75 of the QS regulation requires that validated processes be monitored and controlled so that when changes or process deviations occur, a manufacturer review and evaluate the process and perform re validation when appropriate. 21 CFR 820.75(c) requires you to have computer equipment validation documentation procedures in place for evaluating; when computer equipment validation is again required. Procurement and Computer Equipment Validation . Recent research has highlighted that in the pharmaceutical and bio-medical industry, thirty two per-cent of all equipment procurement is unsatisfactory. The major problem has been identified as companies not specifying in sufficient detail and or accuracy, what their actual needs are. The lack of a quality company approved User Requirements Specification (URS) , leads to many companies having to resort to otherwise un-necessary and costly retrospective actions in modifying the equipment or producing unspecified documentation or engineering drawings, post procurement. These extraneous GMP requirements often cost more than the equipment. VMP to VP Correlation and Integration. d) All performance requirements that the software has to deliver. g) What constitutes an error and how errors should be handled. j) Ranges, limits, defaults & specific values found acceptable. k) All safety related requirements, specifications. l) The degree to which the manufacture is dependent upon that software. Computer equipment Validation Change Implementation. Automated processes: When computers or automated computerized data processing equipment is used in any way which can affect the quality, efficacy or regulatory records of a regulated product or process, the manufacturer must carry out computer equipment validation; sometimes termed Regulatory Qualification, using purpose designed computer equipment validation documentation. The execution of which will verify that all the pertinent URS and cGMP requirements have been complied with. Post completion of computer equipment validation; any future proposed software or hardware changes must be approved prior to implementation. Post implementation it is required to execute a Validation Risk Assessment (VRA) to ascertain the degree of validation that is required; to return this equipment to the “qualified” status. In this diagram it can readily be seen that the URS, along with the VMP and the applicable company Practices and Procedure documents, come together and are used to produce a Project Quality Plan (PQP). This can be vendor or end user produced. This PQP must document the scope and intensity of the QA and QC involvement in the design, build, test, commissioning and validation of the proposed equipment. The PQP will also specify the range of documentation that must be produced to enable the regulatory compliant introduction and maintenance of the equipment into cGMP use. Once this documentation is produced, a complete package of validation or Qualification documents will be raised consisting of the DQ, IQ, OQ and PQ. The execution of these protocols must verify that all the end user's requirements as specified in the URS are fully complied with. Computer equipment validation documentation activities are grouped in two colors (orange and blue). The blue colour is the requirement for standard computer equipment validation documentation. The regulators have decreed that software used in a manner that can affect the quality of the product without leaving visible evidence; that damaged has occurred, must be deemed as critical to the quality of that product. The regulators have further mandated that all such software be identified as such - and subjected from concept to actual use, to Full Life Cycle Validation (FLCV) requirements. This additional computer equipment validation documentation is represented in the diagram in orange. The vendor therefore (be they in, or out, of house), must produce a Quality Plan that the software development will follow. A validation plan similar to that shown in the diagram. Your actual diagram must be planned and justified for the software equipment that you are proposing. This combination protocol has been produced in response to several hundred reader suggestions we received in our ‘Suggestions Section’. It has been carefully designed to make it the preferred choice for Process and Laboratory stand alone equipment. It is interactive, easy to use and suitable for all mixes of equipment with and without a software validation requirement. 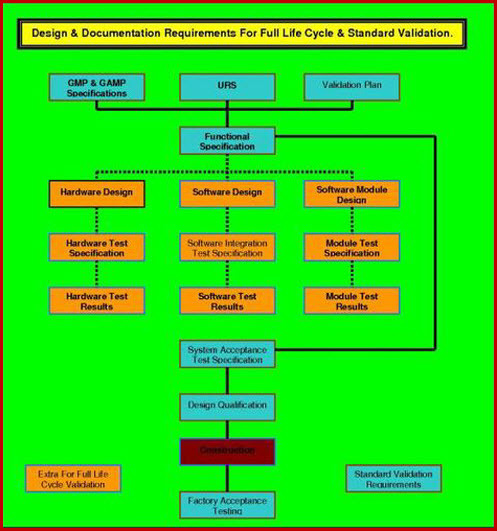 The document that specifies software validation standards for your computer requirements in a manner that ensures when a system or piece of equipment is selected, it will deliver the functions you want, it will have maintenance standards, it will have calibration records, it will have all the documents and records to enable successful validation to be completed. This document was designed to be used as a live document up until the DQ is completed and approved. The Computer equipment Validation Master Plan, is the starting point for software validation, and hence the most important validation document. It improves validation efficiency greatly by forcing all concerned to document, review, and discuss, the proposed methods and allotted responsibilities. It is an expected document with the FDA, and a mandated document with the EU. This document follows Validation Online's standard method of using a fully detailed and interactive generic document and enabling to use the attached SOP to quickly convert this generic document into a first class company bespoke document. This Computer Software Validation VP, details and integrates all software validation activities and procedures required for a small to medium sized project, involving production/facility/utility equipment using electronic controls or monitoring. This computer equipment validation package is suitable for all major software validation projects and contains the underlisted interactive documents. VMP, VP, URS, VRA, DQ, IQ, OQ and PQ. The complete chain of regulatory required documentation for the validation of a computer system minus the VMP. This sofware Validation Package contains one of each of these documents:VP, URS, DQ, VRA, IQ, OQ, PQ. This Computer Vendor Audit document should be customized using the built in tools. The document can then be targeted to reflect your project priorities. The fifteen chapters all contain 10 questions, the total scored is then weighted to reflect your priorities. By assessing the importance of each of the chapter subjects in your project, the weighting is altered taking points from one and adding to others. This enables your assessment to be expressed simple and clearly as a percentage, allowing clear unambiguous comparisons to be presented for competing companies. Computer Installation Qualification (CIQ) is an important step in the overall software validation and qualification process for software and computer systems. Our protocol leads you through the detailed requirements. 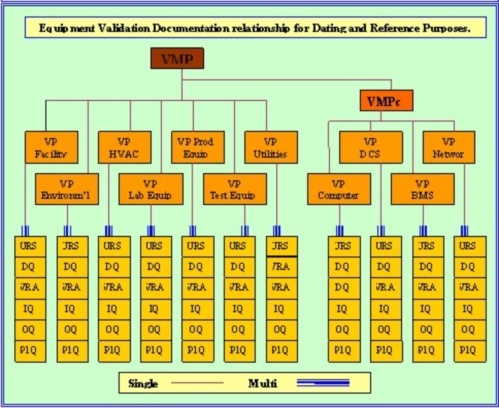 Operational Qualification (OQ) is an important step in the overall software validation and qualification process for software and computer systems. Our protocol leads you through the detailed requirements, progressively and simply. The Computer Performance Qualification is the culmination of the software validation process. The protocol is used in conjunction with the system operating SOP, to verify that the system process is consistent and correct. The results of the testing must be recorder and reviewed with a view to ensuring that any deviances (within permitted tolerances) that exist are random and not a trend that will lead to out of specification operation during production use.